Are 30 day contact lenses safe to wear? Do they let enough oxygen through to your eyes? In the past, extended wear contact lenses were blamed for many an eye infection, largely as bacteria could get under lenses when inserting them and, without cleaning and removing those lenses everyday, the bacteria thrived and infected the eye. The plastic used to make lenses also prevented enough oxygen getting through to the eye and, as these lenses were re-used after the 7 or 30 day wear time, the amount of bacteria build-up after 30 day contact lenses wear was difficult to remove. If you were lazy enough to use extended wear lenses, then you were more likely to be lazy with your cleaning routine = a bacterial disaster zone for your eyes! But in recent years, the FDA has approved certain lenses for extended wear due to advances in materials technology which allows far greater breathability and, as most sleep in contacts are now disposable, there is far less risk of an eye infection. That said, I personally would not want to wear the same pair of pants without showering or changing for 30 days, so I ask you, would YOU want to leave the same bits of plastic in your eyes, day in, day-out? If you have a lifestyle that demands a more flexible kind of contact lens, one that can be worn continuously, then the latest silicon hydrogel technology could offer the perfect sleep in contacts for you. This material allows up to SIX times more oxygen through to your eyes and, as a result, some lenses made from silicon hydrogel have been approved by the FDA for up to 30 days wear. One of these is AIR OPTIX NIGHT and DAY. 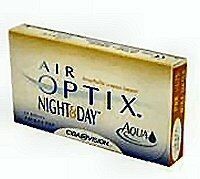 Ciba Vision's AIR OPTIX Night &Day Aqua contact lenses are the first silicone hydrogel soft contact lenses to be approved by the FDA for continuous wear for up to 30 days and nights, even while you sleep. You then thrown the lenses away and grab a new pair of 30 day contact lenses. In the past, extended wear contacts were criticised as they simply did not allow eyes to breathe properly, but these revolutionary lenses allow six times more oxygen through the lens than traditional soft lenses meaning wearers can expect thirty days of continuous, comfortable contact lens wear. And that means complete freedom  perfect for those with busy lives - no need to worry about taking lenses in and out plus there are no cleaning or lens care solution costs. They're so comfortable, you might even forget you're wearing them! Plus, you'll see clearly all the time  even when you get up in the middle of the night. Ideal for people who have problems with allergies, for the person with an active lifestyle, and for those who hate taking lenses in and out every day. And in case you thought overnight contact lenses were only for people with an easy prescription, think again. If you have astigmatism, you can now buy extended wear toric contacts too, like AIR OPTIX for Astigmatism by Ciba Vision. These contacts offer the highest oxygen transference of any available soft toric lens, so your eyes can stay whiter, healthy-looking and most importantly comfortable, no matter how long the lenses are worn each day. Some opticians may say that you can wear AIR OPTIX for Astigmatism for seven days or more, but like all sleep in contacts, you need to guage the lenth of wear-time according to how comfortable your eyes feel. As toric lens users tend to suffer from dry eyes more than most people, it's unlikely you will be able to use extended wear toric lenses as 30 day contact lenses, but you will be able to sleep in them overnight. Remember: If in doubt, take them out!